If you're not hearing angel sing when you hear the phrase, “investing in mortgage notes,” then you will want to do what ever it takes to be at our next presentation. You will not only learn how to buy, sell and investing in mortgage notes, but you will learn why they are smart alternative to being a landlord. In the world of real estate investing we have so many options for investing our time and money. But isn’t it true, that most of us want to invest in real estate so that we can choose what to do with our time and more importantly have the money to do it? And let's face it, are you looking for another J-O-B! And sometime, investing in traditional real estate deals can seem like another full-time job. But aren't we all really looking for passive income? Income that comes in whether your laying on the beach, spending time at your child's school event or however you choose to spend your time. When you join us this Saturday, March 26, JW Warr will be here to show us one of the easiest and most lucrative ways to invest your money using very little of your time and comparatively speaking, a Small amount of your money. Property Acquisitions Headaches! – Endless marketing, talking to distressed home owners, or property analysis..You’re not buying the property. Property Owner Headaches! – Rehabbing, Property Insurance or Property Taxes – You’re not the home owner. During his presentation, JW will show you how YOU can become the bank and reap all the monetary benefits that they do while enjoying your time the way you want to. When you invest in notes with JW, you will be able to invest in properties site unseen, nationwide. And when you invest in notes with JW he does most of the work for you… The hardest physical work you will do is, walking to your mailbox to get your money. What could be better than that??? 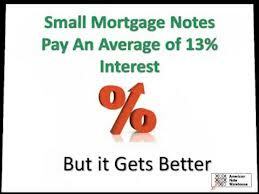 It makes sense to use mortgage notes as part of your investment strategy because they provide a safety net from a fluctuating market and offers you a chance to profit from all the good things in real estate while avoiding all the bad things. The last time JW presented to our group, we left with our heads exploding with new investment possibilities. Join us for this mind blowing, yet very simple investment strategy that anyone can use for long-term WEALTH that pays double digit returns and is back by real collateral. OPEN NETWORKING – Meet fellow real estate entrepreneurs and share knowledge, resources, and expertise in the important business of wealth building through real estate investing. INTRODUCTION by Joe Boston: Find out about our group, sponsors as well as our upcoming activities and events.